In recognition of National Bullying Prevention Month, Oyster Bay Town Supervisor Joseph Saladino and Councilwoman Rebecca Alesia announce a free Anti-Bullying Parents Workshop will take place on Thursday, October 25th from 7:00pm to 9:00pm at the Town of Oyster Bay Ice Skating Center in Bethpage. The workshop will feature guest speakers from the Long Island Coalition Against Bullying and Nassau County Police Department. Counselors will also be available for private one-on-one discussions about individual circumstances. 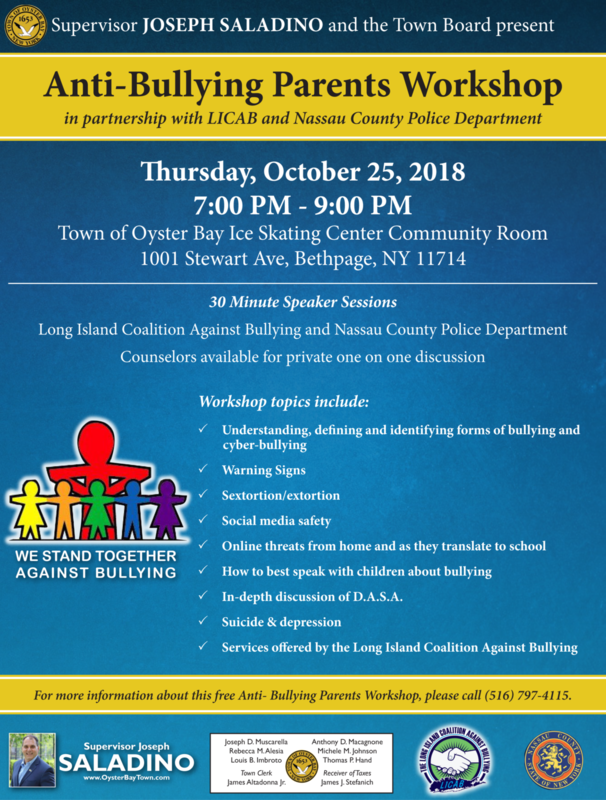 Earlier this month, the Town of Oyster Bay partnered with the Long Island Coalition Against Bullying and Long Island Crisis Center to offer a “Put Bullying on Ice” Awareness Night with free ice time at the Bethpage Ice Skating Center. For more information about this free Anti-Bullying Parents Workshop, please contact the Town of Oyster Bay Parks Department at (516) 797-4115.